Amazon is a step closer to finalizing its HQ2 plans, having narrowed its sights on the top 20 contenders after receiving over 230 proposals from across North America. 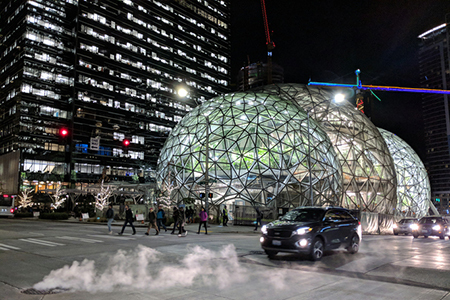 While the winning city could be any one of the short-list nominees, Amazon has made one thing clear: It is looking to build HQ2 away from the West Coast, which currently houses its principal headquarters in Seattle, Wash. Although Los Angeles is still in the realm of possibility after making Amazon’s top 20 list, most of the other locations are closer to the East Coast, with a few others scattered across the country. “Amazon will bring thousands of high-paying jobs to one of these cities and will boost overall local economic growth—all of those highly-skilled engineers will need doctors, real estate agents, barbers, babysitters and baristas, too,” said Aaron Terrazas, senior economist at Zillow, in response to the top 20. With new job opportunities, the chosen city can expect a surge in relocations or commuters from those seeking employment. Daniel Evenchen, REALTOR® with the Mike McCann Team, Berkshire Hathaway HomeServices Fox & Roach REALTORS®, believes Philadelphia’s prime location nearby other massive metro areas is one of the biggest reasons Amazon has short-listed it. “Of a location perspective, we’re very close to Baltimore, Washington D.C. and New York, but, comparatively, we have a lot of room for growth,” says Evenchen. If Amazon attracts more individuals willing to relocate rather than commute, the winning location will need to prepare for an influx of incoming buyers and renters. The top 20 cities are already making plans for the possibility of HQ2. However, adapting to a flood of new buyers will not be easy. Many of the top 20 cities are currently dealing with tight inventory, a problem that will only be exacerbated if Amazon moves in. The proof is in Seattle. Evenchen foresees a challenge in the new construction market. Since the rental market in Philadelphia is moving quickly, any incoming buyers who are looking for new housing may be met with few options. Ritchie believes Columbus will face similar challenges. Regardless of challenges, these cities made Amazon’s top 20 list for a reason. Ritchie believes Columbus caught Amazon’s eye because of its ability to attract millennials, and its talented workforce, moderate housing costs and standard of living. Terrazas agrees. “Columbus may be a surprise to some, but it has long featured a dynamic combination of size, affordability, access to higher education and room to grow,” said Terrazas, stating that the top 20 list is made up of well-established cities. As for Philadelphia, Evenchen believes the location’s potential is in its diversity. Meanwhile, other cities, such as Los Angeles, are already dealing with more severe challenges. However, with every challenge comes an opportunity. Shcherbatyuk believes one of the city’s biggest obstacles may turn out to be an advantage. Over 85 percent of the cities that submitted proposals didn’t make the cut, and many feel Amazon is losing out on their location’s advantages. Cities that were not chosen should not discount the possibility of other major tech giants making their way over. With the new tax bill in place, various companies have announced they are putting their tax cuts to good use. Apple, for example, announced its plans to build a new major campus stateside; however, the New York Times reports that Tim Cook, the company’s CEO, will not be following in Amazon’s footsteps, and instead using a different strategy to find Apple’s ideal location, rather than relying on a public bidding process. Regardless of how these companies decide on new ventures, the winning cities can expect a bustling local economy that creates new jobs and a busy real estate market.